A perfect example of style at its peak is no other than Jessica Alba. The hottest of all the most classy of all and the most stylish of all completing all her marksÂ in this world.The most best thing about her that she does not fix her self with one style and make others bond to follow, The best thing about her that she changes her style according to public needs and demands as well as with time She always amaze her inspiring followers to get her new style clothes with cool in thing. The part of her changing dressing sense is here at famous movie jackets with the stylish name of Jessica Alba Pink Leather Jacket comprises of shirt style collar short in looks with vest fitting and complete body tech wire which makes it superb and awesome at peak. It is in a shiny pink color. So just get it now!! 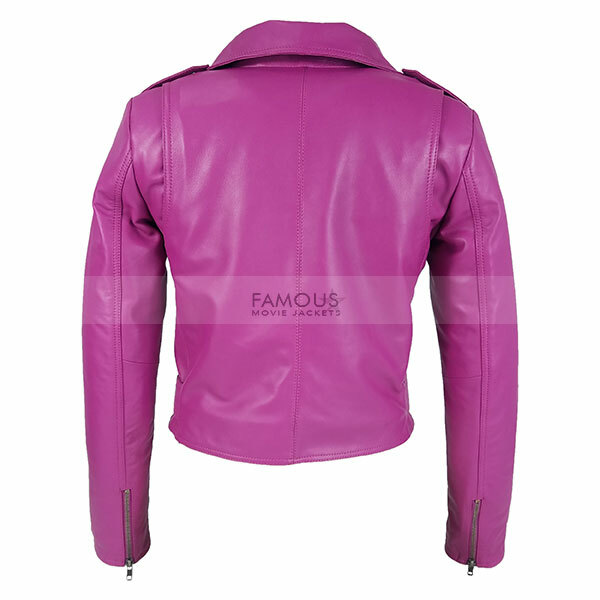 super soft leather material with quality detailing, i like that Jessica Alba style, i order little light color rather than the original and good to see that it’s good, because this shocking pink is not good enough. It’s a very beautiful and lovely jacket and I’m happy with my purchase. Thank you! This jacket is totally awesome. Initially ordered mine in real leather and size medium that fits perfectly to my 41″ chest. The sleeves were short just an inch. Everything else worked perfectly with this Jessica Alba Pink Hot Jacket. I’m happy that I bought this in Real Leather so now it will last for a longer time. Shipping is safe and fast.